May 1, 2009 by Ken Ward Jr.
It’s the new book by Kentucky author Silas House and Jason Howard, editor of the forthcoming, We All Live Downstream. It’s published by the University of Kentucky Press, and you can read their promotional material on it here. 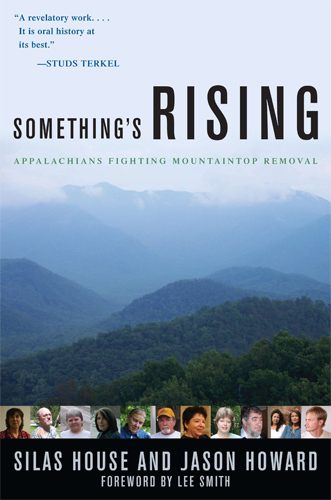 The book is a series of essays about various major figures in the region and in the battle over mountaintop removal, including Denise Giardina, Jack Spadaro, Carl Shoupe, and Jean Ritchie. By happenstance, I was talking on the phone today to the legendary Wendell Berry, and he told me that he was reading “Something’s Rising,” and was especially enjoining the chapter on Ritchie.Â If that’s not enough of an endorsement, I don’t know what is. than ever. God help the coalfield counties.